Once you make these, it’ll be hard to go back to plain potatoes! They do take a while but they are so worth it (and most of it’s done, out of the way, in the oven) – crispy on the outside and soft on the inside, they pack a flavour punch with the lemon and oregano. It’ll smell like summer at your place! Grab a large baking dish and add all the ingredients, stirring the potatoes around to coat. and stir to coat. You want a good blend everywhere of all the flavours. 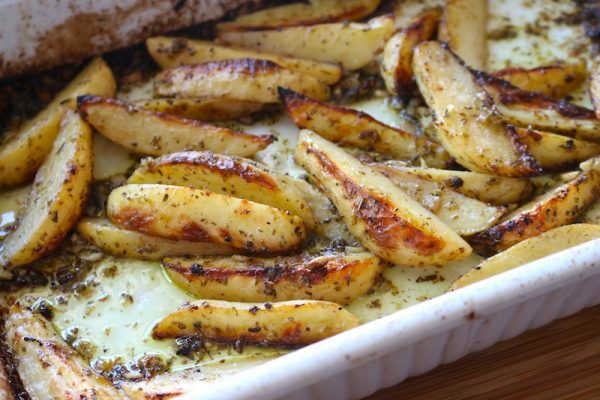 Bake for 40 minutes, then give it all a big stir – you want to get all parts of the potato in the dry heat of the oven to crisp up. Bake another 40 minutes until the water has evaporated and the flavourings are clinging to the potatoes with the remaining oil. Don’t take it out of the oven until the edges are proper golden brown, feel free to turn the oven up for five or 10 minutes to achieve that. When all the potatoes are cooked through and golden brown, remove from the oven and sprinkle a little extra salt over. If you've got extra fresh oregano, pop some of that on too. Delicious!